The grand neglect by mainstream Islam to recognize the crucial significance of secularizing knowledge to create an intellectual, social and political environment that would stimulate scientific pursuits and modernizing trends has meant the furtherance and dominance of the mytho-historical mindset that equates secularization of knowledge with heresy. Intellectual de-Hellenization that began in the 12th century eventually led to the 'The Closing of the Muslim Mind'. The Islamic resurgence that ushered in the 1980s, and which proudly proclaimed, 'Islam is the answer' ended up producing Salafism, a religious purification movement, with multiple shades and shapes, but failed to open up the mental closure. This is not to deny the extraordinarily rapid economic transformation experienced by the oil rich states during the past three decades or more. However, that transformation was simply an attempt to replicate, at colossal cost, the West's outer form of modernity as exemplified by the ultramodern Arab metropolitan centres and the consumerist ideology embraced by their citizenry but not the West's inner spirit of enquiry and secularity that brought forth the outer modernity. The techno-scientific mindset of the West that engineered the birth of its modernity kept aloof from the mytho-historical mindset of Muslims, and as a result, what occurred in the Muslim world was a form of pseudo or superficial modernity. Given this situation the switch from one mindset to another requires nothing short of a revolution in intellectual thought and educational approach, and in the context of the Muslim world it particularly demands a radical change in the form and content of teaching and learning and the way educational institutions are operated. Even though secular education was introduced from outside during the colonial period, which continued and expanded after decolonization, orthodox religious indoctrination carried out through traditional madrasas and from the pulpit has so calcified the Muslim mind that questioning the piously inherited wisdom from the past has almost become taboo. What is required is not simply modifying the syllabi in the traditional teaching institutions but changing the teaching method to cultivate 'creative doubt' in the minds of the learners. The efforts of the balanced reformers through their writings and public lectures in the 19th century did indeed create a class of intellectuals in the Muslim world who were willing to utilise the power of reason and critical thinking in their approach to religious scriptures and modernity. One would have hoped that the petroleum induced financial boom in the 1980s would carry forward the achievements made until then. On the contrary, the rise of Islamism with its Salafist variant pushed the clock back to the seventh century. Pervez Hoodbhoy, a distinguished physicist from the Quaid-i-Azam University in Pakistan has the following observation about a conference held in Kuwait in 1983 to 'identify and remove bottlenecks in the development of science and technology in the Arab world. But, a single topic dominated the proceedings: is science Islamic? The Saudis held that pure science tends to produce 'Mu'tazilite tendencies' potentially subversion of belief. Science is profane because it is secular; as such … it goes against Islamic beliefs. Hence,… although technology should be promoted for its benefits, pure science ought to be soft pedaled'. It is this anti-science attitude, breeding intolerance towards the growth of techno-scientific minds that led to the exodus of Muslim intellectuals to the West. There is no equivalent today in any Muslim country to the 'Baitul Hikma' of 8th century Baghdad. Abdelwahab Meddeb, a professor of comparative literature in the University of Paris, reckons that, 'There are over four million Arabic-language manuscripts in existence … Many of these manuscripts have never been studied or published'. Where is the repository in the Muslim world that holds these treasures where scholars can go and study without unnecessary encumbrances? How does one compare this pathetic situation with the translation movement of Abbasid Caliphate, which induced Muslim scholars to travel around the world in search of works composed in foreign languages, and brought home and translated into Arabic? 'The Arab Human Development Report 2002', sponsored by the United Nations, states that 'The cumulative total of translated books since the Caliph Ma'moun's time (the ninth century) is about 100,000, almost the average that Spain translates in one year.' During the Abbasid era, it was the growth of the knowledge industry that made Arabic the 'lingua franca' of scientific knowledge and gave the word dragoman (a derivation from the Arabic 'tarjuma' meaning interpreting) to the English vocabulary. It is an irony that while Brigham Young University in Utah, United States, a Mormon academic institution, has engaged in translating the ancient Arabic works into English, the International Islamic Universities that sprouted after the oil boom have shown no interest at all in translating the outstanding works in foreign languages into Arabic, Persian and other languages spoken by Muslims. China liberated itself from dogmatic Maoism and embraced a 'bird-cage' market model roughly around the same time as oil-rich Arab nations started relishing their newly found petro-wealth. In 2011, China commenced its FAST (Five-hundred-meter Aperture Spherical Radio Telescope) project, the largest of its kind in the world, and completed it in 2016 at an estimated total cost of $180 million. Whereas Dubai, the richest oil economy, invested around $1.5 billion to build its Burj Khalifa, the world's tallest tower and completed in 2010, which is a stupendous structure of shameless opulence and haughty achievement of conspicuous consumption. This is one example that demonstrates where the priorities are between China and the Arab world. While FAST depicts the achievement of a techno-scientific mind Burj Khalifa represents the achievement of a mytho-historical mind trying to recreate the fantasies of the Arabian Nights with hyper-technology. China has opened its doors to the best and beautiful Chinese minds currently living in foreign countries to return home, and by offering them lucrative working conditions the Chinese government is encouraging them to contribute to the national goal of achieving world leadership in science and technology. Similarly, India, another emerging power is catching up fast in competition with China. 'Escape to the West' is the only avenue available to many Muslim intellectuals, thinkers, researchers and writers whose works find no appreciation but often enmity and opprobrium at home. The Islamologist Bassam Tibi advises 'intellectually significant Muslims … who hope to apply reason to Islamic reform … to do so in their Western exile, be it Paris or London or Washington'. Akbar S. Ahmed, the Ibn Khaldun Chair of Islamic Studies in the American University in Washington, while focusing on the situation in Pakistan lamented in his 1988 publication the colossal brain drain from Muslim countries to the benefit of the West. According to him, even the Nobel laureate in physics Abdul Salam although a Pakistani by birth 'is a product not of Pakistan but of Western universities'. The story of the Egyptian Quranic scholar Hamid Abu-Zaid is a telling example of how tyrannical has Islamic orthodoxy become in suppressing critical thinking. Abu-Zaid in his 1995 publication 'Naqd al-Khitab al-dini' (Critique of Religious Discourse) suggested along the Mu'tazilite thinking that the Quran was a partially human product because language is a human invention. Abu-Zaid's free Islamic thought deemed as heresy by the Egyptian court and the author was declared an apostate and compelled by law to divorce his Muslim wife. He had to flee Egypt with her to The Netherlands and lived as an exile until he returned to die in his home country in 2010. Another notorious example is that of the Sudanese religious scholar Ustad Mahmud Muhammad Taha. He developed the thesis of the Second Message of Islam, in which he proposed that the entire corpus of the Islamic 'sharia' needed to be reviewed in light of the Quranic verses revealed to the Prophet in Mecca, which were universal in outlook, rather than in light of the revelations in Medina, which address to a particular society. The Sudanese judiciary declared him an apostate and executed him in 1985. The Muslim world today comprises of nearly one fifth of humanity living as majority in 57 countries (58 if Palestine is included), all of them members of the Organization of Islamic Congress (OIC) – a virtually voiceless entity in world affairs – and as minorities in almost every part of the world outside the OIC. Yet, no Muslim-majority country has developed politically, industrially or militarily to reach the status of at least a regional power like China or for that matter even Israel so that its voice can carry some weight at international level. If for example, a community of Chinese or Jews anywhere in the world were to suffer physically or materially at the hands of a non-Chinese or non-Jewish majority or state China and Israel are ready to raise their concern at a world forum and the forum can ill-afford to ignore their protest. This is not the case in the Muslim world. For example, hundreds of thousands of Rohingyas in Myanmar killed, raped, tortured and evicted from homes by a state supported program of ethnic cleansing. 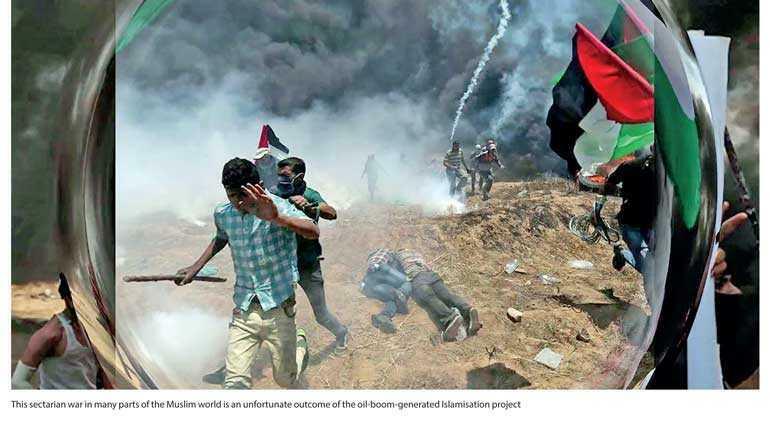 So far not a single Muslim nation represented in the United Nations except of course Bangladesh, which is at the receiving end of this atrocity, has raised concerns about these people. The oil boom as indicated earlier provided the Muslim world led by the Arab nations a manna of opportunity to wake up from its millennium-old slumber, an opportunity to bring about a desperately needed Islamic reformation, which several Muslim thinkers from Al-Afghani to Rida and Abduh were advocating in the 19th century. A prerequisite for this reformation was to unshackle the Muslim mind from its mytho-historical traps. Bassam Tibi, quoting the Syrian thinker, Tayeb Tisini, wrote, 'Had heretical Islamic philosophy and sufi Islam been able to gain the upper hand in Islamic history, and had they not been so successfully combated by the 'ulama', they could have made an important contribution to the industrial development of what was at that time a socioeconomically developed Islamic society'. Tragically, heretical Islamic philosophy and sufi Islam are both under attack from the so called Islamic purists who are now propagating their own but dubious 'counter enlightenment'. The Islamization project born out of the oil boom reintroduced with vigor the historic combat between religious orthodoxy and orthopraxy on the one hand and the spirit of Mu'tazilite rationalism, better termed as scientific intellectualism on the other. In this new phase, the inherent contest between the two adversaries acquired a political dimension and turned into a battle for thought control. Whereas Islamism, defined as 'religionized politics' or as 'a movement to reform the political order on the basis of norms, values, laws and institutions enshrined in the traditions of Islam', calls for total surrender to orthodoxy with no room for intellectual pluralism, scientific intellectualism advocates freedom of thought, believes in heterodoxy and promotes values of tolerance and compromise. This conflict is openly prevalent in both Sunni and Shia sectors of Islam. While the mullahs of Iran champion religious orthodoxy and orthopraxy in Shiism, the Wahhabi Salafists anchored in Saudi Arabia and with their agents spread out everywhere, represent the same in the Sunni world. The philosophy of both groups of Islamists, as Reilly says, is 'grounded in a spiritual pathology based upon a theological deformation that has produced a dysfunctional culture'. Scientific intellectualism is a victim of this deformed theology. The contest has become more complex by the intervention of foreign powers driven by their own geo-strategic and economic interests in the Muslim world. As a result, the battle for thought control has taken a detour and turned into an open war between two sectarian theological deformations, one championed by Saudi Arabia and the other by Iran. This war has brought nothing but years of untold violence, bloodshed, death and destruction, not to mention the depletion of resources on a grand scale. This sectarian war in many parts of the Muslim world is an unfortunate outcome of the oil-boom-generated Islamization project. The weapons and technology used in this war of attrition, the modernity displayed by ultramodern Arab cities and the consumption culture that has captivated the minds of Muslim youth reflect not any originality or indigenous modernity of the Muslim world but the imitative display of the outward European or Western modernity. For any society to advance intellectually, economically and even culturally political stability and social harmony are essential prerequisites. Civilizations prosper under the ambience of political tranquility and social peace. Without tranquility and peace, progress becomes spasmodic at best and retarded at worst. The lack of popular legitimacy to many ruling regimes adds more to the instability. Political illegitimacy produces authoritarianism and dictatorship, and often ends in tyranny. In limited cases as in East Asia, authoritarianism has at least gained a contractual or consensual legitimacy by delivering material comfort to the majority. In the Muslim world in general, it is the absence of such legitimacy and the failure of postcolonial development experiments that has been largely responsible to the rise of Islamism. However, the growth of Islamism, both in its quietist or scholarly and jihadist or violent formats, has only accentuated political instability and social disquiet. As an ideology of opposition and with totalitarianism as its model of government, Islamism has become both a political destabiliser and a social disrupter. Global geopolitics entering from outside has made the situation worse in many Muslim countries. In such a complex and discouraging societal context, what prospect is there for any meaningful reform that can transform the mytho-historical mindset to a techno-scientific mindset? A radical shift in the mindset requires an ideological transformation in thought. Arkoun's call for the 'unthinkables' and 'unthoughts' would involve a war of ideology. However, the manner in which the world in general and the West in particular has reacted to the challenge of jihadist Islamism has made an ideological war extremely difficult if not impossible. The fact that Jihadist Islamism has unleashed an infernal wave of extreme violence and horror is beyond dispute. The threat of violence calls for counter violence. This is exactly what the so-called war on terrorism and counter terrorism has resulted in. However, the even darker side of this endless confrontation from the point of view of Muslim reawakening is the unchallenged ascendancy of historical religious orthodoxy and parallel denigration of Islamic heterodoxy. Hamid Dabashi, Professor of Iranian Studies and Comparative Literature at Columbia University, captures in a nutshell the direction of change needed in the Muslim mind. 'Islam has always been', says he, 'the dialogical outcome of Muslim collective consciousness engaging in conversation with the dominant moral and intellectual forces in the world – from a position of power. Having been for over two centuries at the receiving end of European and American imperialism, and having turned their faith into a singular site of ideological resistance to those empires, Muslims will now have to retrieve the habitual dialogue, though not from a position of power but from a position of 'care' – care of the other, of the world, that will in turn redefine who and what they are'. In another instance, he calls for the restoration of the historical 'cosmopolitan worldliness' under which Muslim civilization flourished. The opportunity for that retrieval and restoration has unfortunately been allowed to slip away partly because of the misdirection of the Islamization project discussed earlier and partly because of the conflictual and confrontational environment created by the War on Terror on the one hand and Salafist Jihadism on the other. In the absence of any alternative and credible world surveys, the Pew Research Centre's opinion poll carried out amongst Muslims in 2011 and updated later on a variety of issues such as terrorism, al-Qaeda and ISIS, violence in defense of Islam, sharia and assimilation in the West one could clearly detect the dominance of the mytho-historical mind. How does one explain the resilience of this mindset in the Muslim world despite the rapid penetration of modern means of communication? The blame for allowing this thought dominance to prevail and become even more obdurate falls heavily on Muslim intellectuals who have de-linked themselves from the general Muslim public. The flight of the techno-scientific minds from Muslim countries to the West is irreversible. Having sought refuge in the West these thinkers continue to write and publish their thoughts in journals and books, which are read and critiqued within the circle of academics and intellectuals, and their ideas rarely reach the wider Muslim community. Their thought products are an acquired taste to the Muslim majority. While the techno-scientific minds have confined their progressive ideas within the precincts of academia and research centers, pulpits in the mosques, the social media and public platforms are monopolized by the purveyors of mytho-historicism. The communication revolution that heralded the era of so-called globalization has provided immense opportunities to pseudo-intellectuals and semi-literate Muslim religious marketeers to indoctrinate the masses with their own versions of Islam and Islamism. No doubt, there is widespread anger and frustration amongst Muslims at all levels at the historical injustice and humiliation inflicted by Western colonial and post-colonial empires. However, deprived of access to volumes of critical and dynamic analyses on present predicament ,authored by a new generation of Muslim thinkers, writers and intellectuals, the general public in the Muslim world, partly because of its unfamiliarity with the language in which they are written, and partly because of the stigma of heresy stamped on those writings by orthodoxy, has fallen prey to false promises and misguidance championed by mytho-historicism. This in essence is the tragic situation of the Muslim world today. The agony over lost glory continues. The 'Arab Spring' that began with the self-immolation of a street vendor, Mohammed Bouazizi, in Tunisia on 4 January 2011, and soon spread to Egypt, Libya, Yemen and Syria, where mass protests removed three tyrants in the first three and dragged the fourth into a cauldron of mindless destruction and monumental humanitarian crisis, actually started with a promise of 'hope, trust, fecundity, and rebirth'. In terms of the sectarian binary of Islam although the Arab Spring was mainly a Sunni phenomenon, Dabashi finds its ideological roots in the 2009 Green Movement in Iran. In these unfinished revolutions Dabashi also saw an opportunity to 'not only the end of militant Islamism but of all absolutist ideologies'. However, as he expected, counter revolutionary forces have succeeded in restoring the ancient regime in all those hot spots. Even if the Arab Spring had succeeded in ending militant Islamism and all absolutist ideologies, it is doubtful whether it would have created a mental revolution of the sort discussed in this article. Yet, the collective revolutionary demand for 'freedom, social justice and dignity' chanted by a new generation of Muslims and reverberated in Tahrir Square in Cairo, which also echoed in Morocco, Tunisia, Yemen, Libya, Syria, Bahrain, Dubai and beyond also carried an embedded warning to orthodoxy that its controlling power over young minds was coming to an end. In the final analysis, the Arab Spring even though still remains an unfinished revolution demonstrated another missed opportunity. What is actually required is an open physical and mental space for Muslim intellectual minds to think and express freely without the fear of facing persecution and harassment by an oppressive orthodoxy. In fact, the most salient feature of orthodoxy is not its claim to represent the absolute truth but its 'position to impose sanction … upon dissenters'. In concluding his quite illuminating analysis of the need for heresy in Islam, Anouar Majid, a professor of English at the University of New England has expressed the same concerns raised in the foregoing discussion. In his words: The 'zanadiqa' of Islam, as well as Islam's persecuted or neglected philosophers, are also Islam's only hope to break free, finally, from the tyranny of Sunni orthodoxy and carry on the work that had long been cast in Islam's golden trash heap of history. For modernity, in its Islamic sense, is no more than embracing the right critical method and ensuring a society that doesn't punish difference or proscribe intellectual pluralism. The call for a shift from the mytho-historical mind to a techno-scientific mind is indeed a call for zanadiqa. It is the only gateway for the Muslims to recapture at least part of lost glory of Islamic civilisation.